What is described as a small drone was found on White House grounds on Monday morning. President Obama and the First Lady are on a trip to India. The Security Service is looking for the perpetrators. White House Press Secretary Josh Earnest confirmed that “a device” has been found. "The early indications are that it does not pose any sort of ongoing threat to anybody at the White House," he said. The Secret Service announced that one of the agents saw and heard a two-foot-wide "quadcopter" fly at a low altitude over the premises about 3 am local time. "There was an immediate alert and lockdown of the complex until the device was examined and cleared," a Secret Service spokeswoman said in a statement, adding that the investigation is underway “to determine the origin of this commercially available device, motive, and to identify suspects." The entire White House perimeter was on lockdown until around 5 am, AP reported. At sunrise, a vast search of the premises was carried out. An unidentified man informed the Secret Service around 9:30 a.m. on Monday that he had lost control of the drone before it crashed onto the grounds, the agency said in a statement. The UAV operator has been "been fully cooperative" and "initial indications are that this incident occurred as a result of recreational use of the device," the Secret Service noted. The man may be a government employee, according to USA Today and other published reports. The Secret Service may refer the matter to the US Attorney’s Office, a government official told USA Today. The US is currently experiencing a private drone boom, but flying drones is illegal in the District of Columbia. The use of remote-controlled UAVs presents massive privacy concerns for the population at large, and has been the subject of much discussion from rights groups. American lawmakers are scrambling to come up with laws that would better regulate the use of the intrusive flying machines. Security-wise, the Secret Service can’t boast a clean track record either. The service has been embroiled in a number of scandals and security flops recently, most notably the October incident, which saw a man with a knife singlehandedly bypass White House security, after jumping the fence, and making it into the executive mansion. Another incident saw an armed security guard, with prior arrests, getting in an elevator with President Obama. 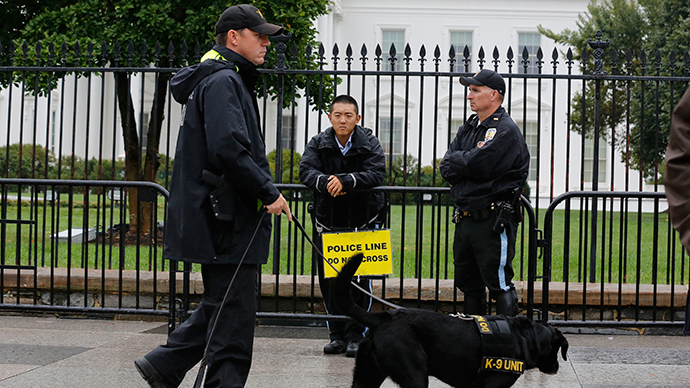 The incidents led to the resignation of the Secret Service chief.